The Williamsburg Area Destination Marketing Committee (WADMC), the Greater Williamsburg Chamber & Tourism Alliance and their marketing agency of record, Luckie & Company, have created a clever, attention-grabbing tourism campaign aimed at combating vacation deprivation. “The Funologist” is in its first month and has already increased website traffic by 55 percent. In a series of online videos and TV spots, real families are asked to discuss family dynamics for a research project. They are shocked to discover that the “doctor” who will be interviewing them is actually a 9-year-old expert in fun called the Funologist. During unscripted interviews, the Funologist, played by Mira Silverman, recognizes some common problems – schedules that are packed more often than suitcases, and a desire to run away from home … as a family. The solution is always a fun getaway to Greater Williamsburg, a destination with such a wide range of activities that there’s something for everyone to enjoy. 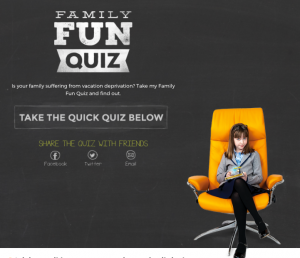 While the campaign takes a lighthearted, tongue-in-cheek approach to how desperately families need a vacation, the effects of vacation deprivation are quite real. Luckie’s research shows that most Americans don’t use all of their paid vacation time, a human truth that has a real impact on children. Yet families that vacation together have stronger relationships, higher levels of happiness and a greater sense of well-being. In fact, 84 percent of kids report feeling closer to their parents when they take time off. With offices in Atlanta, Birmingham and Austin, Luckie is a marketing agency that specializes in the human experience. We use behavioral and data science to develop powerful insights that inform and inspire our story crafting. Then, with a combination of content marketing, CRM, traditional and digital media, and award-winning creative, we help brands find innovative ways to own the customer journey. Today, we’re happy to partner with these great clients to help them get closer to their customers and make the most of their marketing dollars: GlaxoSmithKline, Regions Bank, Piedmont Hospital, Grandview Medical Center, Marriott, Little Debbie, Brown-Forman, Express Oil Change, Alabama Power and Williamsburg, Va. To learn more about our marriage of science and creativity or just to connect with one of our super-talented Luckie humans, check us out at luckie.com. This entry was posted in Agency News, Press Releases, Travel and Tourism. Bookmark the permalink.